"At the end of November 2011, Toronto City Council will begin reviewing the 2012 budget that will affect many of our city services. There will be urban forest items on the City Council meeting agenda scheduled for November 29th and 30th. Please let your Councillor know today that healthy trees are a priority in our neighbourhood! Our urban forest is the living green infrastructure that makes our city livable. We receive huge returns on any investments we make in its care and maintenance in the form of clean air, reduced storm water costs, shade, UV protection, tourism dollars and increased property values. A study in New York City revealed a $5 return for every $1 invested. A recent Toronto study shows that our urban forest provides the equivalent of at least $60 million in ecological services each year (air quality improvements, carbon sequestration, etc.). The benefits derived from the urban forest significantly exceed the annual cost of its management. Protection of our existing trees is of utmost importance – Toronto’s tree protection bylaws must be maintained and enforced. 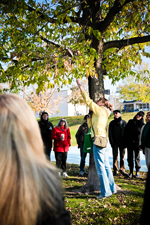 Ash trees represent about 9% of the current forest canopy in Toronto. The spread of Emerald Ash Borer, an invasive insect, will decimate our ash population over the next ten years. Tree protection and planting will need to increase significantly, just to sustain existing urban forest canopy levels. Funding for our urban forest has already been reduced. In 2009, Toronto City Council approved funding for a seven year service plan to better protect, maintain and grow our urban forest; this funding was reduced in 2010 and then suspended in 2011."